In support of Subaru’s 2018 Share the Love Event, the Mascoutah Senior Center is hosting a Canned Food Drive to benefit the Mascoutah Food Pantry. Each canned good donation will earn one ticket to enter a drawing for a $50 gift card to Tom’s Market. The drawing will take place at the annual Christmas party, and you need not be present to win. As part of a national campaign, Subaru of America will donate $250 to the purchaser’s choice of participating charities for every new vehicle sold or leased through January 2, 2019. Meals on Wheels America is a participating charity that directly benefits Mascoutah citizens, and we urge you to choose Meals on Wheels if you are purchase or lease a Subaru this holiday season. 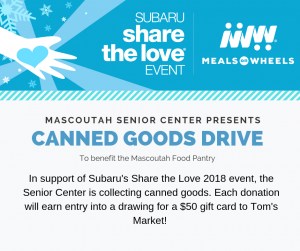 Since the Share the Love Event began in 2008, Subaru and its participating retailers have donated nearly 2 million meals, safety checks, and friendly visits to seniors being served by local Meals on wheels programs across the country. For more information, visit www.mealsonwheelsamerica.org/sharethelove. Please bring your canned goods donations to the Mascoutah Senior Center during business hours (Monday-Friday between 8am and 1pm), and join us for the Christmas party on December 17 from 11am-1pm everyone is welcome! Reservations and a $5 donation are required to attend the Christmas party.